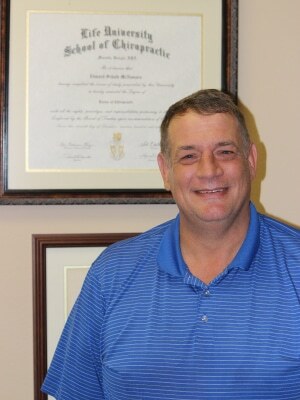 Meet Dr. Edward McNamara, D.C.
Health is not the absence of pain, symptoms, and disease. It is the balance of physical, mental & social well being. Are You Reaching Your Wellness Potential? Our chiropractors are experts in the safe, non-surgical treatment of back pain, neck pain, chronic headaches and migraines, as well as other common conditions. At McNamara Health & Wellness, we are dedicated to helping you achieve the best overall health in your daily life. We take a natural, proactive approach to health care and are committed to helping our patients obtain extraordinary health. Our goal is to help you function at your optimum potential — without the invasive use of drugs or surgery. After my injury, I never thought I would be able to coach again. Thanks to McNamara Health & Wellness, I was able to recover quickly and be ready for the spring soccer season. Cheerleading is tough! Without my constant adjustments I would not have been able to keep up with the pace demanded as a Senior 5 base. Thanks for keeping me in the best shape possible! I’ve never felt better than I do today! After 20+ years of back pain and having just accepted it as being there for the rest of my life, I have a new outlook on life and know that I don’t need drugs to control the pain. Thank you so very much! We offer chiropractic care that is safe, effective, affordable, and family-oriented. Our services include corrective chiropractic care, core stabilization and physical therapy, and wellness care. Our office is located in Lutz, FL, but still convenient for residents in Wesley Chapel, Land o' Lakes, New Tampa, and other areas located north of Tampa! Many of our patients drive long distances from Tampa and surrounding communities just to be treated by Dr. McNamara.